Dexcom, is reportedly developing a blood glucose monitoring app for the upcoming Apple Watch. The news comes weeks after the FDA eased restrictions on companion apps designed to work with medical devices. The smartwatch app will display graphs of actual readings obtained by a continuous glucose monitoring (CGM) device developed by Dexcom, The Wall Street Journal reports. 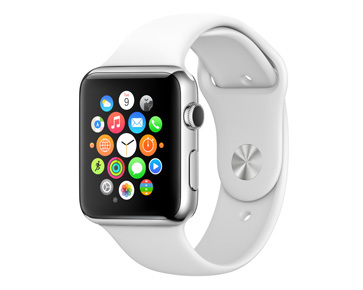 The app is expected to be ready when the Apple Watch is launched this April. Apple refused to comment on the WSJ report. The highly anticipated Apple Watch is rumored to be laden with biometric sensors, and the company has given guidelines and code to developers to create health apps. Dexcom's monitor is a dermal implant with a tiny wire that is capable of monitoring blood glucose levels every five minutes. It eliminates cumbersome and painful finger-sticks, and gives patients a greater degree of glycemic monitoring and control. Approximately 29 million Americans have diabetes. Between 5 and 10 percent have Type 1 diabetes, a condition where the pancreas produces little to no insulin. The more common Type 2 occurs when there is insulin resistance. According to the WSJ, two developments prompted the FDA to relax its policy on apps that connect with medical devices. First, a group of engineers developed NightScout, a system where a Dexcom glucose monitor is able to upload glucose information to the Internet. The system bypassed the usual regulatory approval process but was widely adopted by parents and families of people with diabetes. Secondly, Dexcom recently submitted a separate iPhone app for review that was approved quickly. With greater demand for accessible patient monitoring apps, the FDA felt the need to revisit existing policy regarding health apps while remaining consistent with its regulatory mandate. “We felt that the risks that the app imposed weren’t as high,” said Alberto Gutierrez, director of the FDA’s Office of In Vitro Diagnostics and Radiological Health, according to the WSJ. Under new rules, Dexcom's monitor will remain a Class III device. However, software that allows the device's readings to be displayed on the Apple Watch and similar mobile devices need only to be registered with the agency, per the WSJ. Dexcom last year received FDA approval for its CGM remote mobile communications device called Dexcom SHARE. The device consists of "a secure wireless connection to transmit the glucose levels of a person with diabetes to the smartphones of up to five designated recipients, or “followers,” according to a Med Device Online (MDO) article. The company calls the Dexcom SHARE cradle its Gen 4 CGM technology. It is currently developing a Gen 5 product that connects directly to phones. Dexcom plans a premarket submission of Gen 5 with the FDA in the first quarter of 2015. In a recent interview with MDO, then-CEO Terry Gregg said that they have already succeeded in porting CGM information to a Pebble watch using Gen 5 technology. It is now partnering with Apple to incorporate the technology to Apple’s future products and HealthKit ecosystem. "It is very important for the agency to begin to get comfortable with this whole concept of connectivity, and the risks associated with that and the risk mitigations we’ve put in place, but to ultimately get that to a watch. We are working with Apple right now to integrate glucose information into their HealthKit," Gregg told MDO.